Danielle Haak, who recently completed her PhD from the Nebraska Cooperative Fish and Wildlife Research Unit and the School of Natural Resources at the University of Nebraska-Lincoln, has won the annual Peccei Award for her outstanding research as part of the 2014 Young Scientists Summer Program (YSSP) in IIASA’s Advanced Systems Analysis research program. I grew up in Milwaukee, Wisconsin (USA), and it was there I fell in love with the natural world. As a kid, my family and I spent weekends boating on Lake Michigan, and I’ve always been fascinated by lakes and the hidden world beneath the water’s surface. As an undergraduate, I spent a few summers in northern Wisconsin at a limnology research station, and this is where I realized I could actually make a career out of this fascination! I went on to get a BSc in Wildlife Ecology, a MSc in Biological Sciences, and I recently defended my PhD dissertation that focused on the energetics and habitat requirements of the invasive freshwater Chinese mystery snail. In general, I’m interested in aquatic invasive species and how their introduction affects ecosystem structure, functioning, and resilience. I was drawn to aquatic invasive species during my undergraduate research. My first independent research project was on invasive crayfish in a northern Wisconsin lake; in addition to out-competing the native crayfish population, the invasive species suffered from a fungal disease outbreak, and we wanted to understand its prevalence throughout the lake. I also worked as a technician on a whole-lake study researching the efficacy of manual removal of an invasive crayfish species from another lake. It was a long-term project that successfully reduced the invasive rusty crayfish population enough that the native crayfish population was able to recover, and the entire lake underwent a drastic physical change as a result. These large-scale dynamics have always been appealing to me, and I knew it was something I wanted to pursue in my career. When I started my PhD at the University of Nebraska-Lincoln, our research group had just started a number of side projects on the Chinese mystery snail, and there was an obvious gap in our scientific understanding of the species; thus, it made sense to take advantage of this opportunity! What was the question you were trying to answer in your YSSP research project? My YSSP project built upon my dissertation topic but went in a slightly different direction. My YSSP supervisor, Dr. Brian Fath, and I wanted to utilize the already-established methods of social and ecological network analyses, but in a way that hadn’t been done before. Ultimately, we had two main questions. First, we wanted to investigate how the social dynamics of ecosystems can be integrated into ecological network analysis. And second, we wanted to use network analysis to analyze the ecological effects and movement of the Chinese mystery snail in the southeast region of Nebraska. Because there were a few parts to this research, we had a number of different results. First, we were able to create directed networks of how anglers and boaters moved among a network of flood-control reservoirs. We also developed ecological networks specific to each of the 19 reservoirs included in our study. Both of these findings were relevant by themselves, but the cool part was how we combined them. We adapted the framework of infectious disease network modeling to simulate what would happen within the first 25 years after a hypothetical introduction. The human movements connecting reservoirs were equivalent to a disease’s transmission rate, and the individual population growth of the snail within each reservoir after an introduction was like a disease’s incubation time leading up to a threshold where that reservoir then became contagious. We started with 5 infected and contagious reservoirs, and after 25 years only 5 of the 19 reservoirs did not have the Chinese mystery snail in it. 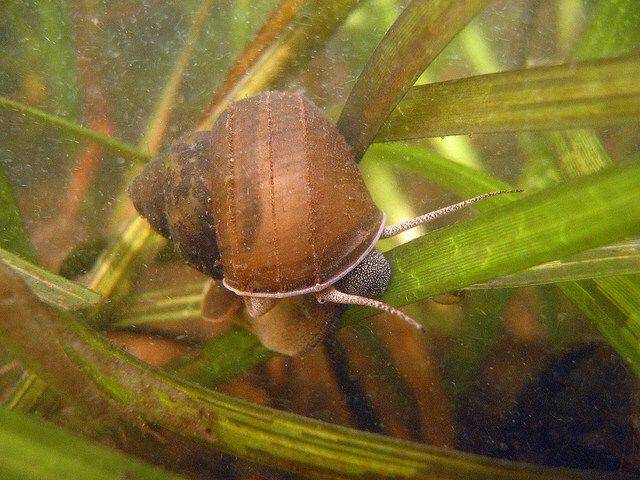 Finally, we identified three of the already-infected reservoirs where preventing snails from being transported out of them would be most critical as well as two susceptible reservoirs where preventing introduction of the snails would be most beneficial. Our preliminary results demonstrated that social and ecological network models can be used in tandem, which has the potential to address a number of complex policy and management issues. Additionally, being able to prioritize reservoirs based on how effective prevention efforts would be allows managers to focus their limited resources in places they would get the best return on their investment. I believe there is also a great deal of potential in using this combined model approach to assess the spread of other aquatic invasive species of concern as well as other types of disturbances. I would like to work with Dr. Fath on refining some of my individual ecological network models, and possibly incorporating some of the additional social data that’s available to us. We also discussed possibly using the approach to look at other questions related to aquatic invasive species, but in different geographical regions and possibly with different software. One of the best parts of this project was coming up with so many questions on where we could go next, and I really enjoyed working with Dr. Fath and gaining a new perspective on the questions that interest me. How did your time at IIASA affect your PhD research? 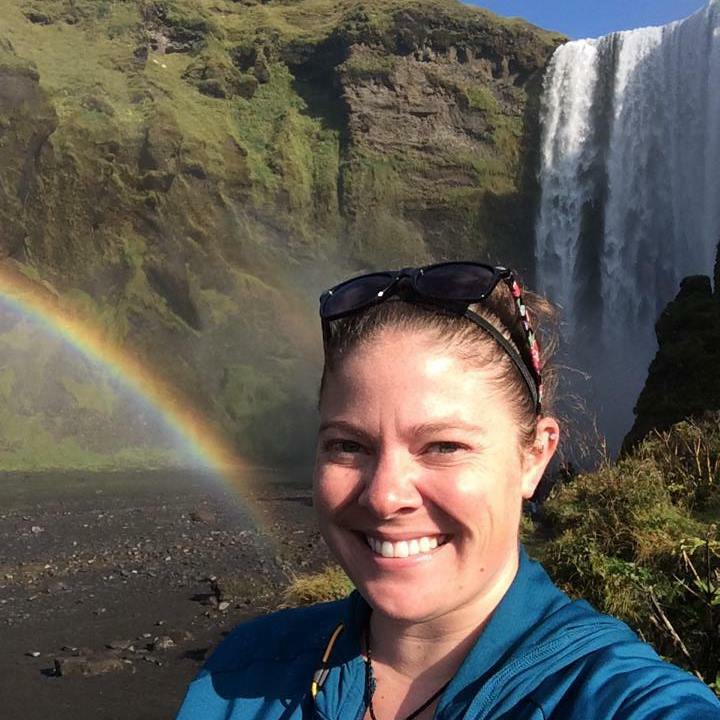 My time at IIASA refreshed my love of the scientific process, and I loved the flexibility in adjusting my project as I learned more and developed new questions. Ultimately, I ended up with an additional chapter for my dissertation and came home with a mostly-completed draft. I loved so much about YSSP and working at IIASA, but the best part was probably the ability to meet other brilliant scientists and students from around the world. In addition to thought-provoking discussions on science and research, we also had some incredible discussions on life in other countries with drastically different cultures. The other students made the entire summer even better, and I’m so happy I was able to participate in such an incredible experience. IIASA has a truly unique work environment, and everyone made us feel right at home. It really was a dream come true, and I’m so excited about the opportunity to return and pick up where I left off. The only thing missing will be my fellow YSSPers! I wish we could all come back every summer! I think my favorite experience was the end of summer workshop and dinner and dance that followed. I was so impressed during the initial presentations and it was great to hear about all the progress that was made in the short three months. Celebrating this progress with a night of dancing and dining was just the perfect ending to a great summer. It was a bittersweet farewell, but I think it cemented our friendships and was a great capstone to an already dreamlike experience! 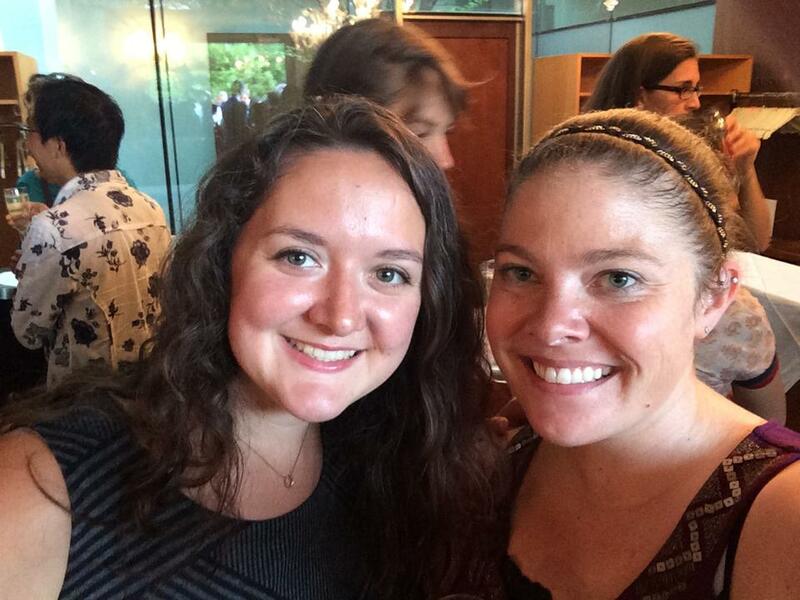 Danielle Haak (right) and fellow YSSPer Adriana Reyes, at the end-of-summer awards ceremony.